San Francisco-based TownHog is rolling out a new feature for its daily deals platform, which will allow third-party publishers to make offers in real time through mobile applications. It’s a little bit like Groupon Now and LivingSocial Instant, which offer deals that can be redeemed immediately and are based on your location. But the comparisons with the industry’s leaders and TownHog end there. Lilia Martinez-Coburn, TownHog’s VP of product and marketing, explains that since getting into the business in late 2009, the company has shifted its focus away from building up a huge sales staff and competing one on one with the giants in the space. Instead, it is offering the platform it built for its own deals to third-party publishers. Today, its platform is being used by several companies, which already have the distribution and the sales force, including CBS Local Offers, OpenTable, Cumulus Broadcasting’s SweetJack.com, the San Francisco Chronicle’s SFGate and others. TownHog’s consumer-facing site now primarily operates in San Francisco only, where it continues to help SFGate source deals. This is the second time the company has shifted businesses. Previously, it was called DotBlu, a social games company that didn’t work out. But since the company still had some money left in the bank, it tried the daily deals business. Many started to think TownHog was again on the downturn earlier this year, when it started scaling back the number of employees it had. Martinez-Coburn explains it has been reducing the number of people on staff because it didn’t need as many salespeople, since its publishing partners were increasingly sourcing the deals directly. 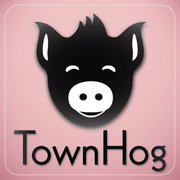 About a month ago, TownHog had 40 employees; today it has closer to 30. “As our partners ramp up and are getting the hang of how to sell this, the hope is for them to take on the role and source their own deals,” she said. Other companies providing white label platforms in the daily deals space include Tippr and Group Commerce. TownHog’s mobile product, which it unveiled today, is called Express Offers. It will allow partners to quickly launch a standalone iPhone app to publish offers. Unlike traditional deals that run for 24 hours and make you wait to redeem them, consumers will have the chance to purchase these offers immediately from the phone or online. Going forward, Martinez-Coburn said she hopes that all offers on their network will be offered instantly because of the benefits to the consumer and the publisher. Publishers gain the opportunity to run more than one offer at a time, instead of providing just one deal a day. In addition, Martinez-Coburn said, it will help with conversion rates. Right now, many publishing partners promote deals on the radio or in the paper, and when people see it or hear about it, they immediately want to go and get 50 percent. When they realize they have to wait 24 hours, the conversion drops off.